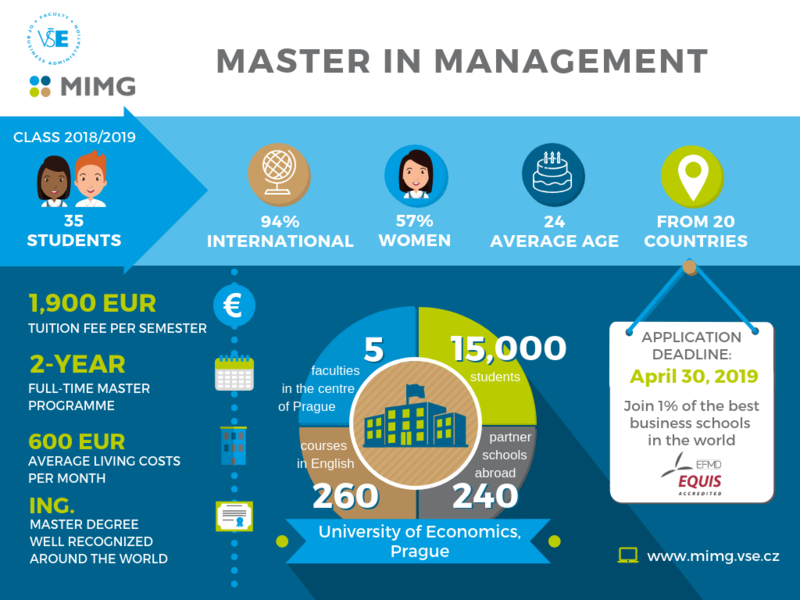 The application deadline for the Master in Management (MIMG) programme is on April 30, 2019. You can find all the requirements necessary for completing your application down below or here. If you need help with submitting your e-application, see the guide here. Submit an e-application and pay the application fee (50 EUR or 1.300 CZK) by April 30, 2018. Submit proof of proficiency in English and send us your bachelor’s diploma and transcript of records along with a motivation letter. Write an essay on a given economic topic and send it till April 30, 2019, and talk to us for a while within a brief interview in Prague or on Skype. The admission results will be announced during May 2019. The aim of our Master in Management degree is to educate analytically and socially responsible minded business professionals with a broad economic overview and a focus on managing business performance.